The recent release from Standard and Poor’s (S&P) and Case-Shiller indicates that their measure of national house prices, the House Price Index – National, rose by 0.3% on a quarterly seasonally adjusted basis in the second quarter of 2015. Including a .03% rise in the first quarter of 2012, the second quarter of 2015 marks the 14th consecutive quarter-over-quarter increase in the house price index. Over this period of three-and-a-half years, the index has risen by 24.5%. Similarly, the recent release by the Federal Housing Finance Agency (FHFA) shows that its measure of house prices, House Price Index – Purchase Only, rose by 1.2% on a quarter-over-quarter seasonally adjusted basis. This marks the 16th consecutive quarter of house price growth. Over this four-year period, house prices have risen by 23.1%. A previous post showed that both mortgage practitioners and the general public expect house prices to rise, while fewer expect house prices to fall. Professional forecasters agree with the view that house prices will continue to rise. However, according to forecasters, year-over-year house price growth is expected to slow, reflecting a return to normality in the housing market. 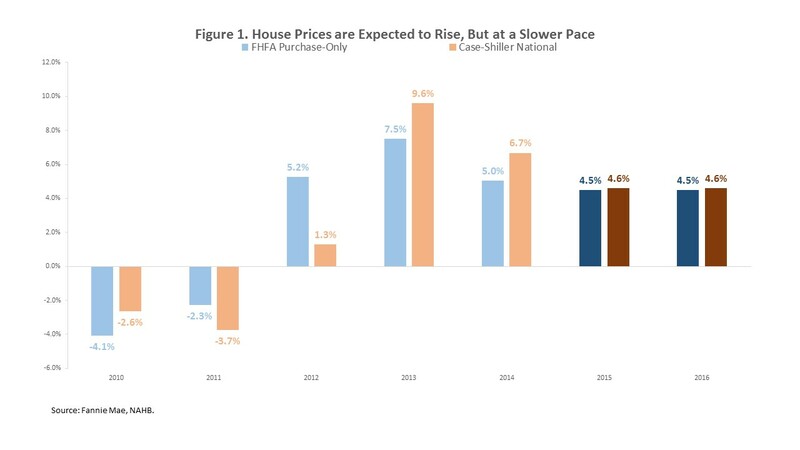 The National Association of Home Builders (NAHB) produces a forecast of the Case-Shiller National House Price Index. The NAHB annual forecast is an average of the quarterly rates of house price growth in the four quarters corresponding with that year. According to the NAHB, the Case-Shiller National House Price Index will increase by 4.6% in 2015 and by an additional 4.6% in 2016. The rates of growth in 2015 and 2016 are below the growth rate in 2013, 7.5%, and 2014, 5.0%. Meanwhile, Fannie Mae provides a forecast of the FHFA Purchase-Only Index. The Fannie Mae annual forecast represents the change in the house price index between the fourth quarter of the forecast year and the fourth quarter of the prior year. According to Fannie Mae, the FHFA Purchase-Only Index will grow by 4.5% in 2015 and by another 4.5% in 2016. The rates of growth expected in 2015 and 2016 are below the growth that took place in both 2013, 9.6%, and 2014, 6.7%.